My final 2 barks I will share with you in this week's Christmas cooking, bark making, simple gift creating spectacular is that of Spotted Bark. 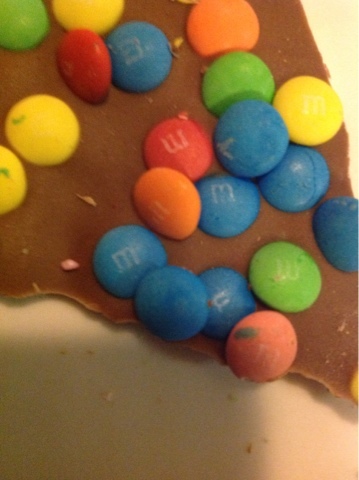 This can be made with a whole range of ingredients to make the spots, I however, used sprinkles to achieve a freckle effect and mini M&M's. 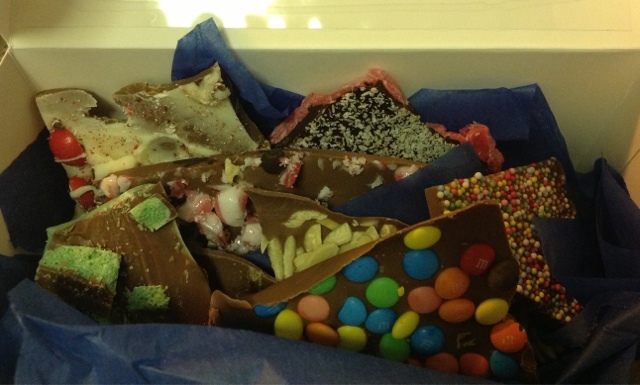 variations could include skittles, smarties, normal M&M's or those of a particular colour, or anything really! 2. Spread chocolate on baking tray on top of grease proof paper. 3. 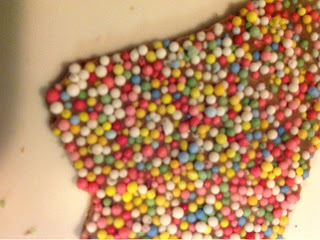 Sprinkle spots over the top. 5. Break up bark and serve. Again.... What can I say.... So simple... So effective!! 2. Spread chocolate on tray. 3. Sprinkle crushed candy canes over melted chocolate. 4. Set, break up, eat, enjoy!! I love peanut butter! There is something comforting about warm peanut butter oozing on toast. Yum! I also find it (along with chocolate) is what I crave most when I have a migraine. Odd! But hey, who is to argue when peanut butter is involved. Except maybe for my brothers, with nut allergies, who would have preferred I didn't eat peanut butter growing up. Oh we'll, older sister got her way....except now they are both well and truly bigger than me and I am "little big sis". So for those of you who do not have a peanut allergy... This one is for you! 1. 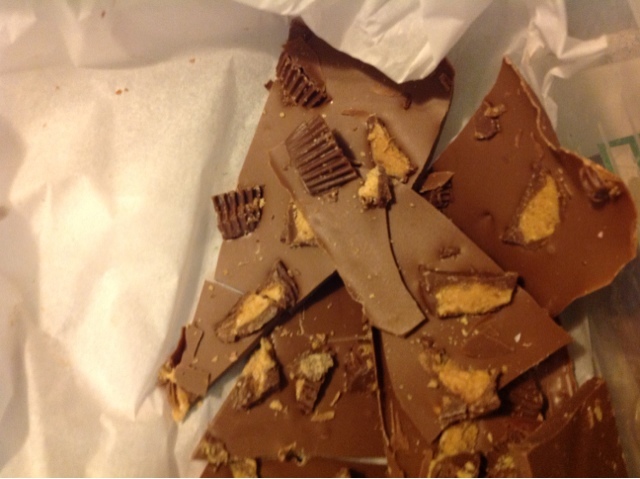 Melt chocolate with peanut butter until smooth. See previous posts for tips. 3. Sprinkle cut up Peanut Butter Cups on top. 4. Stick in fridge until set. 5. Cut up in odd pieces and enjoy! 1. Toast almonds on a tray under the grill in the oven. Watch! These can burn quickly. Shake the tray occasionally. Once lightly golden remove from oven. Allow to cool. 2. Break up chocolate and place in microwave dish. 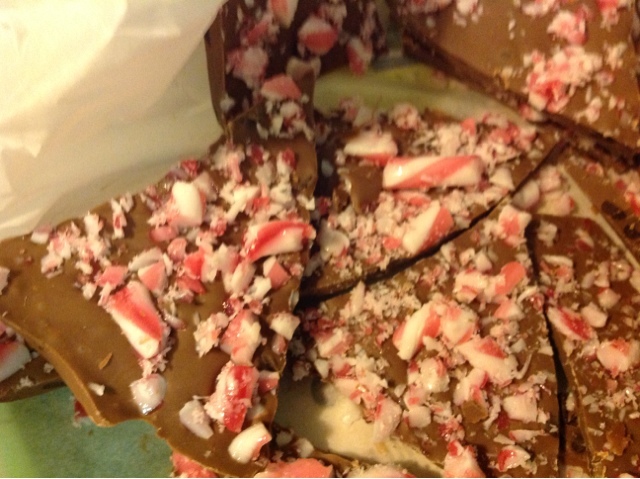 Melt until smooth ( see Peppermint Bark Crunch for melting ideas). 3. Spread melted chocolate on cookie tray. 4. 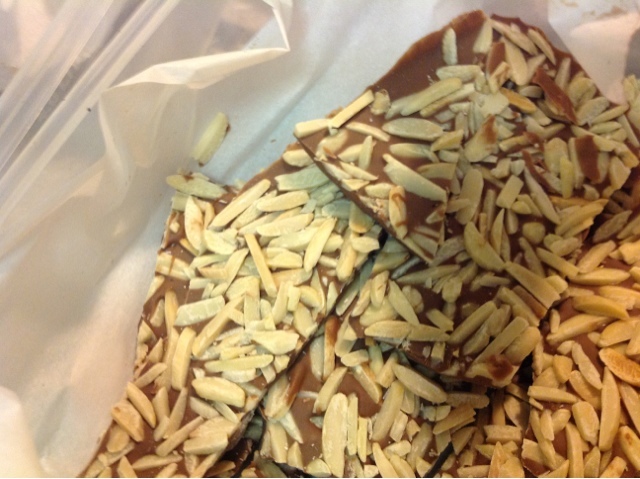 Sprinkle almonds on top of melted chocolate. 5. Place in fridge to set. Around 2 hours. 6. Break up chocolate using a knife into odd shaped bits. 1. Break up white chocolate and place in microwave dish. I then stick it in the microwave on 50% power for 3 minutes. Often I will not need 3 minutes, but I am lazy and would rather stop and start it multiple times than have to reset the 50% power setting. Stop every minute or 30 seconds and then stir till it is the consistency of smooth. Do not leave it too long without stirring. Better to be cautious than over cook. Figure out how your microwave likes it by trial and error. 2. Stir in essence and colouring. 3. Spread evenly on cookie tray covered in baking paper. 4. Place in fridge for an hour. 5. 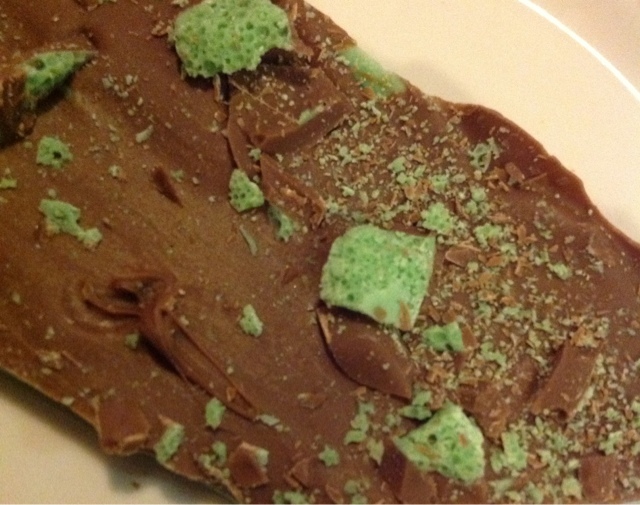 Cut up Mint Bubbly into chunks. 6. Melt milk chocolate in similar way to white. 7. Spread milk chocolate over green chocolate layer. 8. Sprinkle Bubbly over milk chocolate layer before it sets. 9. Return to fridge until firm ( a good 2 hours). 10. Cut roughly into large odd shaped pieces. Serve and enjoy! Not the best picture... But yummy! Christmas is in the air....and here in Australia this means wrapping up of school for the year. It is a time when saying Merry Christmas and thank you to colleagues is inevitable. It is also the time when things are crazy busy...organising Christmas concerts, farewells, parties, and cleaning. I always leave my gift making to the last minute...this year I thought I would be vaguely organised! That is when I stumbled on chocolate bark. Make a few trays of different varieties and package nicely in some cupcake boxes. Add ribbon. Write a nice card and you have a simple, cheap and easy, but oh so effective, gift. 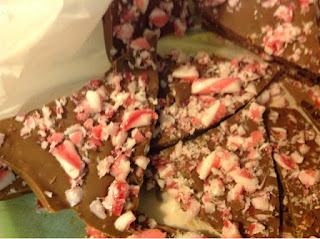 This week, my aim is to share with you some of the simple "chocolate bark" recipes. I have never been a coffee drinker... Loved the smell... Loved tiramisu...but never got into coffee. That was until necessity called. Overseas with 38 students, 4 staff and I was soon starting to realise that just having a hot chocolate during the daily coffee run was not going to cut it. So was quickly persuaded that something stronger might be good for me... And so the coffee drinking began!!! Well, now that I am a coffee drinker, I decided that I now needed a proper coffee table. Well, not really, but I thought the segway was appropriate. I have been enthralled by the number of up cycled pallets on pinterest and so I decided it was time to give it a go. It appears people were quite doubtful when I told them my holiday project was converting a pallet into a table. Anyway, I was all excited for how it could go. I actually hadn't figured out how I was going to go about this until I had the pallet and could actually see and feel what it's character was like. And so here it was. A bit crusty in parts, but with character and a good size. I thought about whether I could or should add planks or not but I loved the simplicity of what it was. So, out came the trusty sander, a whole heap of elbow grease and I had sanded it back. Next some stain. I had 3/4 of a pot left over from my chairs and hey as it said 16sq metres coverage I was sure it would suffice. Well- I struggled to get 1 coat on just the top bits out of the tin- so it really was some thirsty wood. A second tin later and it had a double coat. It came time to attach some wheels. I really must get my own drill. Maybe that can go on the Christmas wish list. (brothers- take note) So, anyway, mum came over with dads drill to lend a hand or two! The absolute joy and excitement I felt when I was able to turn it over onto its wheels. It looked so cool!! It's so amazing what can be turned into something lovely. A few days later my glass was ready from a local glass person. I had ordered a 90cm x95cm piece of glass- 6mm. Plus 2 pieces 40cm x 90cm to fit in as shelves. Picked it up. Popped on some gel dots to even things out and popped it on the top and we were done!! A lovely table to enjoy coffee (and plenty of cake) at!! I love the idea of sharing my home with others. Being able to invest in others and make them comfortable so that I can build relationships with them and share my life openly and honestly. So hospitality is something that rings true for me. Of course, I love cooking and baking and that side of "entertaining" but I feel that how and where you do this is just as important too. Recently I had 8 people over for dinner, some of whom I had known for years, others who are new friends. I loved the conversations and the quality time, I loved coming away with so much more than some dirty dishes (which the dishwasher can look after anyway!). It was great to see relationships being formed, faith shared and common interests revealed. I had fun! Mix this love of hospitality with my creative side, and the fact I really don't want to spend huge amounts of dollars on things for my house, comes the concepts of "reclaiming", "reusing" and "upcycling". It has been great to share this journey with many friends who have similar eyes for detail and want to invest their creativity into their homes. So that takes me to where I am heading today... chairs!! The lonely old chair, sitting on the sidewalk awaiting a slow, lonely, painful death having been rejected by it's previous owner, no longer being able to live up to it's original glory. Or maybe it is the chair located in the local vinnies, awaiting a better life? Sometimes you really do wonder when or where the fabric choice was ever fashionable. If they have a good solid frame, and you give them some TLC -these chairs can have a brand new life. Step 1: Find a chair! Yes, that may in fact involve stopping the car, getting out and picking it up off the side of the road. When I was trying to load the old stripey chair above into my car, a lady walking past offered me the couch she had inside her apartment up the street as well! (I declined! )Vinnies, old wares stores or garage sales are also places to find some old treasures. Step 2: Pull apart all of the cushions. A good set of pliars, a hammer and a stanley knife will all be of use. Try and keep the cushion below intact. This at times will involve a lot of pulling and shoving to get the fabric off and to make something of the old staples and nails the last person used. Step 3: Assess the quality of the wood. Does it need sanding back? Does it need some glue? Painting or staining? Thanks Tim and Amanda for giving me my very first power tool for Christmas... the sander is getting a good workout! Step 4: Set the old covers aside. These will be useful for sizing up new fabric. Assess the state of the foam or wadding. If it consists of old gross innards, chuck them away and replace with a piece of foam you have cut to size. Take a new piece of wadding that would reach all the way over and underneath the cushion. Spread it tight and wrap it like a present or hospital corners on a bed. Staple in the sides to the bottom of the base. Step 5: Pick your fabric... Bold and bright... natural....patchwork...coffee bags??? The choice is yours. Step 6: Measure your fabric. You want the fabric to be able to reach all the way around and with room at the bottom. Use a piece of calico as a template to get the sizing right. This calico can be stapled in place over the foam for extra structure. Cut your fabric to size. Step 7: Get the staple gun aready! Start stapling the edge of fabric that is out of sight. Use lots of tension and staple other bits in. Really you need to go with the flow... Hospital corners, wrapping presents and folding are helpful thoughts to help with the process. Edges can be neatened up with ribbon and/or upholstory tacks. Warning this part can be addictive once the chair is really taking shape. Late one night I was well and truly into finishing my dining room table chairs with the staple gun when I realised it was after 11pm and maybe I wasn't being the best neighbour to those in neighbouring apartments. Step 8: Tops of chairs might need to have their edges sewn together inside out- like making a pillow case and then fitted over the top of the cushion. Sides of the top of the chair were stiched. 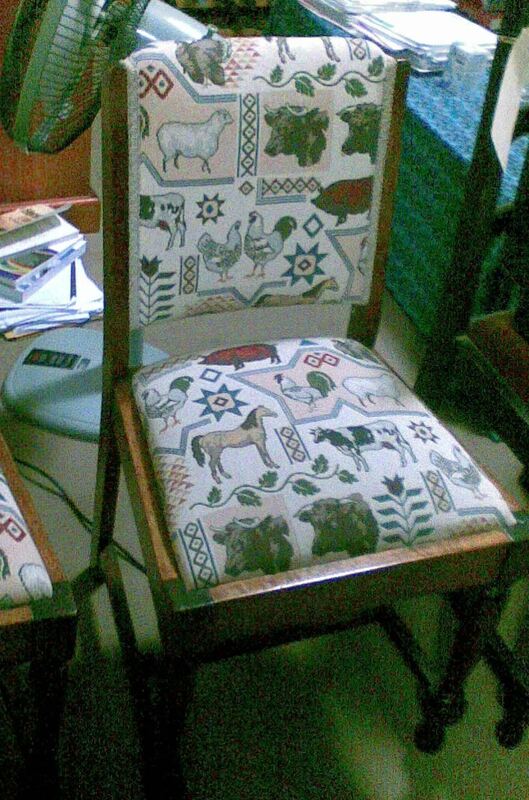 Tacks used on the front of this chair to hold the fabric in place. May your home be a blessing to others! And for me... what to cook for the next dinner....hmmm??? Sandwiches are not my favourite food...the squished up playground memory... no matter how hard mum worked to make us yummy, tasty sandwiches, with interesting fillings, made fresh each day, by lunch time they just were not appealing!! Who can go wrong when chocolate, icecream and biscuits are all together!! These are great to take and share for dessert or as a special treat. Cream together the butter, the sugars and the vanilla until light and creamy. Add the egg and mix well. Mix in the flour. Once combined, stir in the mars bars and chocolate. Roll spoonfuls of mixture into balls and place evenly on a tray with room for spreading. Flatten balls before baking in moderate oven for 10-12mins. Or if your oven is like mine and has no sense of temperature, bake until lightly golden. Remove from oven and leave on tray to cool and harden. Feel free to use Snickers, Cherry Ripes or whatever chocolate bar you like best! (Recipe adapted from Australian Womens Weekly- Beautiful Biscuits). Leave icecream to melt a little. Leave honeycomb in bag and bash it up a bit with a rolling pin. Mix crushed honeycomb in with icecream in a mixing bowl. In a slice baking tray, place a piece of baking paper. Evenly spread icecream out on tray, about 3cm's thick. Return icecream to the freezer for a couple of hours. Take icecream from the freezer and remove from tray. Using a scone cutter, cut rounds from the icecream. Sandwich a round between 2 cookies. Stick them back into the freezer until ready to serve. A sandwich where even the crusts will be devoured!! I've been asked twice recently what my ideal or dream job would or could be. When I start to ponder this, I have been taken out of the city to a dreamy place of fresh produce from the garden, country cooking and market stalls. Something out of a Tasmania or New Zealand tourism ad, with vintage bikes and carefree living. And so without much hesitation I have replied "jam maker". Or a jamstress as one friend put it. Take me to the place of pouring over a large pot of sugary sweetness. Mixing it to perfection (or into a form of something hopefully edible!!) Bottling the goodness and sharing it with my family and friends. For me baking, cooking, creating is a form of stress release! A moment of heaven or dreaming within a crazy day or week. A time when I am lost in creating a tasty morsel that will bring (hopefully) joy into a friends life, a time for them to stop and be able to treat themselves in their chaotic weeks or days, a time to share hospitality and grace with those around me. The fact that baking is a stress release for me is well known amongst my friends and colleagues, so much so that I wonder if sometimes they cause stress in my life in order to reap the benefits of a tasty treat brought into share the following day. One day I was baking for work and had messaged a friend to see what was an allowable ingredient amongst her intolerances. She replied very quickly with "are you okay?". So, here I have put together my thoughts on cooking, creating and faking it. 'Cause really, you don't have to be a pro to bring homely goodness into the world. You just have to know how to fake it and fake it well!! When a spoonful sets on a cold plate you are done. Spoon into a steralised jar. (washed in hot soapy water and dried in a hot oven) seal with the clean lid and turn it over to set. The challenge now is to make it classy!! Add a splash of strawberry liqueur to your berry jam. Really the possibilities are endless. My general rule of thumb is keep the fruit to sugar ratio, if the fruit doesn't contain much pectin and you want a firmer jam add a few squirts of lemon juice or jamsetter (found in baking section of Woolies), be creative especially in summer when there is so much cheap yummy fruit about!! As I share with you my thoughts and experiences of truly being able to fake it in the kitchen and beyond I apologize to my friends out there who ask me for my recipes and really can't cope with "well, I added a cup or so of this and that and then mixed it till it was moist" as the answer. Baking to me is a creative outlet and is not contained to the rules and regulations set out in recipes! I apologize!! So Emma, there will be no exactly leveled off cups of flour in any of my scone recipes! !